They say you never realize how much your parents did for you until you have a child of your own. All the late nights, lessons taught, dollars spent, all to be appreciated in a single moment of revelation in the delivery room. Since I'm not a father myself, it's safe to say I have no idea how much hard work and tough love my parents drove into me during childhood. Being a child is about living a perfect blend of ignorance and innocence; we want our ice cream now and find it ridiculous that we have to wait until after dinner to have some. Why is that a rule anyways? Being a young employee is a similar phenomenon when you're hired into an established organization with bosses and procedures. On one hand, the newbie is supposed to come in and learn the firm's dynamics to fit in and help out. On the other, they're expected to shake things up by adding fresh ideas to old mentalities. If done right, a new hire can spark real change at a firm and make everyone better. If done poorly, associates can feel trapped in a binary system where their only choices are to adapt or walk away. Management ultimately decides the fate of the cogs in that system. Now that I'm wearing manager's shoes, my role is the ungraceful mixture of grounds keeping and open-mindedness. Yes there are rules and culture lines not to cross, but if we always do things the old way, we'll turn obsolete in no time. So which rules are worth keeping and which ones do we change? After all, culture trickles down from above. The other dynamic I picked up as a newbie manager was how hard it is to develop young talent while also doing my own job. Our clients know me as their “Financial Planner,” but the firm mostly needs me for management and daily operations duties. It turns out all of the above could be full-time jobs of their own. With an ever-growing list of clients and fresh talent waiting to be manicured, how do you find time to do a good job and make sure new associates do well too without being labeled the dreaded micro-manager? When I was the fresh talent myself, the only thing I was focused on was advancing quickly. I had moved across the country for this opportunity and only gave myself one choice - succeed. I saw some early success and wrongly assumed it was all because of me. My entire perspective changed when I became a manager myself. My big moment came a few years ago when our firm decided to hire our first intern. I consider myself a big brother at heart, so managing and mentoring a young person seemed like a breeze. A couple of months into gasping for air, the lessons came pouring in and everything my own manager had done for me was finally coming to light. Opening my eyes for the first time, I could see how much had been done for me over the years. The client I gave advice to and bragged about for days? My early promotion and title change? The raving reviews from clients where I’d done half of the work but got all the praise? All were opportunities that I would not have had access to without my own manager’s blessing. All the well-intentioned, perfectly delivered lessons on Time Management, Managing Up, and Excellence that I basically ignored all surged back to me at once. I came to this firm feeling like an eager, talented person ready to shape the world. To someone who'd been around the block, I was the kid who viewed life through the lens of a not-so-perfect blend of ignorance and innocence. But a good manager presses on because they know what’s on the other side of the struggle. It's amazing how much of life we can take for granted until we have perspective. And now that I’m standing on the other side, it’s my job to make sure the next generation has opportunities of their own to advance quicker than they ever imagined. Our team was down by 1 point with 30 seconds left. The ball was passed to me and I knew this was my moment. I faked left then took an aggressive move to the right. I didn't make it far though, as the defender reached his leg out and drove his knee into my thigh. I fell down, buzzing with adrenaline as the referee called the foul. Our star player pulled me to my feet and told me "you got this." With the pressure on, I walked to the free throw line to take my shot. We were in "bonus" time, so if I made it I got one more shot, which would put us in the lead to win. The pressure was even higher for me. 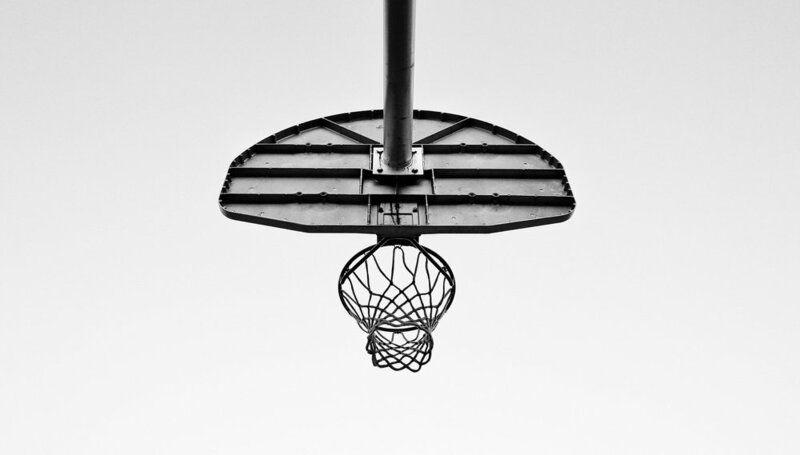 I was a senior on the team, and basketball was my guiding light. If we won this tournament game, we'd win a trophy and bragging rights for life. On top of that, my parents had recently announced they were separating from each other, so I poured all of my mixed emotions into this sport. At the free throw line, opposing fans booed loudly to break my focus. I took my shot and I made it. Our fans roared in hysteria as we tied the game in the final seconds. At 17 years old, I'd never felt more alive. Feeling overconfident, I looked back at the booing fans and did an 'I can't hear you' signal with my hand to my ear. I felt like the star in my favorite movie. Before my next shot, our coach called a timeout to go over our plan. In the huddle, with fans and cheerleaders chanting in anticipation, coach drew up the play. "Alright, when Bryan makes this next shot, here's what we're going to do..."
I have no idea what play he called. All I knew was that the entire team knew I was going to lead us to victory. My teammates had absolute confidence in me. I lined up to shoot, with the opposing fans booing again and our fans remaining focused. I took the shot. With the score tied, we went into overtime, where the other team took the lead and we eventually lost. The bliss I experienced moments before was followed by immense disappointment. My trophy was gone, along with my pride. I've replayed the ending of that game tirelessly over the years. What if I had made the shot? I was devastated and, as a hormone-filled teenager, the lessons I took away were warped by my lack of perspective. Now over a decade later, I'm finally realizing those traumatic moments are still valuable to me today, but in a completely different fashion. It's kind of like re-reading a book years later, only to gather completely different takeaways from the author. We could probably spend our lifetimes re-visiting the same experiences and drawing different conclusions, each more insightful than the last. After re-visiting my traumatic defeat, here are the lessons I've uncovered with new perspective. The most thankless position in sports is the field-goal kicker on a football team. Most teams run well over 100 plays per game, but when the kicker misses and we lose, we often blame the kicker. Teams duke it out for over an hour and have countless opportunities to score, but when the end of the game nears, we irrationally focus on the final moments. I can't tell you what the 33rd play was, but I can tell you about the last few. When we look at final moments, we sometimes forget the early ones that led us there. We forget about the silly fouls where we gave the ball away, but instead focus on the 'game-winning' play. I'm reading a life-changing book called Atomic Habits (James Clear) where the premise is to focus on tiny actions that slowly compound until great things are achieved. Too often we see the child prodigy or the tech billionaire who struck gold and think, "must be nice." When in reality, they've be training their entire lives for an undisclosed future. Inching closer to their vision each day until they reached an inflection point. The same works in the opposite direction too. In personal relationships, we say that a couple broke up because one of them 'cheated,' but what were their daily actions in the months leading up to the moment of betrayal? Poor habits compound and can lead to catastrophe. Relating the concept to business, I've learned that small wins each day will eventually lead me to becoming a master of my craft. And while my big moments are now centered in conference rooms instead of basketball courts, I know that daily advancements will keep me paced ahead so I’ll never need to rely on a last-minute effort. In that tournament game, my coach let the team know he trusted me, and everyone followed suit. From that moment forward, I chose to step into the shoes of a leader. Even though I missed, everyone considered me a leader, so I took the loss with class and encouraged my disappointed teammates to do the same. If done right, being dubbed a 'leader' can change a young person's life. It's a lot easier to step up when someone you look up to believes in you. As an employee, my manager has found countless ways to make me a leader in our organization, and now it's my job to do the same for the associates at our firm. If you're a manager, it's important to help your people train intentionally each day so that, when they're ready, they can lead you to victory. They'll never have the opportunity to succeed unless you give them the chance to fail. Biographies are fascinating, but if we look at our own memories, there are dozens of gems you can learn from. No purchase from Amazon necessary. With new life experiences, comes perspective we can then apply to countless personal memories. Perspectives change over time and traumatic memories can often be transformed into beautiful lessons. Sometimes it just takes a decade to see them. Life gets busy, and reading always seems to be one of those things we push to the side. But we (the Millennial Planners) have always connected on the books we read and the takeaways we get from them. I went an entire year thinking I didn’t read much, but after Regan asked us to share our favorite books, I was pleasantly surprised how much we all read collectively. Keeping up with an old tradition, we decided to pass along our favorite books that we read in 2018. Truly skin-crawling first person. My favorite King ending so far. Nothing I knew as a child was true! A very adult perspective on one of my childhood heroes. Running Man: A Memoir, by Charlie Engle - A story of a crack-addict turned ultra marathon runner. Very inspiring, but it is one of those stories where nothing ever seems to go right for someone. Kafka on the Shore, by Haruki Murakami - This was my fifth or sixth time reading this book. It was originally my first Murakami novel. It never fails to bring me back to that magical place I entered the first time I read it. Foundation, by Issac Asimov - This was my favorite of the several Sci-Fi novels I read this year. It was also on Elon Musk's list...but I am not going to let him take credit for popularizing an author who has written 500 books and is published in 9 out of the 10 Dewey categories. The Martian, by Andy Weir - I know I am late to the game on this one but it was amazing. I was impressed at the author's attention to detail when it comes to scientific principles. This was by far the book I most recommended. The Giver, by Lois Lowry - A childhood favorite. One of my favorite dystopian novels. easy read, his first book. shared his bio and rough childhood. It opened me up to a powerful concept I've embraced in 2018 - being vulnerable and recognizing who you are, what your issues are, and accepting their impact on your daily behavior. super fascinating stuff and it felt like a way more tangible version of "thinking fast and slow" (which 99% of ppl don't actually finish, bc boring). Jason did all these studies on himself to see how humans are wired and how much of our programming contradicts being good with money. Eric writes a blog about a concept I love - what popular culture says it takes to be successful is wrong a lot of the time. I love counter-culture stuff in general. I did not finish this book, probably made it halfway through. I had high hopes, but something about the writing style didn't make me want to continue on. That said, I could pick up at any random Chapter and it would read well. another blogger, which I actually recommend you sign up for if you like the concept (2x week emails). I appreciate James' concise writing style too. Perhaps Recency Bias is at play, but I feel this concept has impacted me the most this year. "we don't rise to the level of our goals, we fall to the level of our systems." "atomic" meaning small things, over and over, matter. Goals are useful, but not the measure - habits (daily behavior) are what create progress and nothing happens overnight. It's a double-edged sword - habits multiply in both directions. Lifting weights weekly creates positive effects that compound. Similarly, 1 cigarette per day will compound negatively. The book also describes how to create positive systems. One major one? Tribes (Millennial Planners, anyone? ;) ). Note: I'm only on Ch. 5 of this book, and it's clearly already impacting me greatly. There are actually 2 books in the edition i have - that's why it's physically huge. I read the first half- Life Principles - and appreciated Dalio’s mindset towards making rules and creating systems that allowed Bridgewater to grow and how he learned from his mistakes. Dalio is a bit dry, but his takeaways are quite interesting. So it's good for those who want no-nonsense and straight to the point advice on life and business. I read blogs more than anything and am on Twitter more often. I'm an official Ritholz fanboy, and mostly read posts from their newest addition, Nick Magguili (https://ofdollarsanddata.com/). Thank you! Enjoy fresh insight whenever we create fresh content.